The Optoma EP716R is essentially an upgrade of the machine first offered last year. 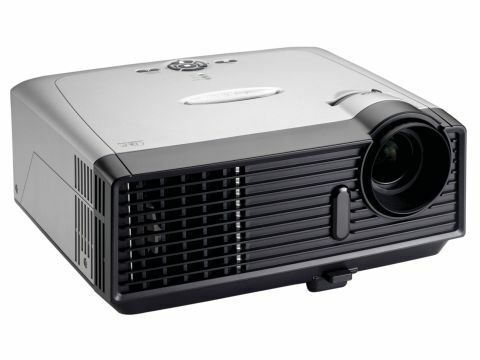 With an increased brightness of 2200 ANSI lumens, this is an incredibly bright projector, especially considering the price. Contrast ratio has also been improved to an equally impressive 2200:1. While this isn't a video product, you can use it for DVDs with impressive results. To make things easier, you'll find that Optoma supplies a SCART to VGA adapter as standard, so you can source directly from your DVD recorder. In keeping with this theme, where this unit excels is in its connectivity. You'll find two VGA ports, one used for the SCART option, VGA-out, S-video audio, video and RS232 ports. However, the native resolution hasn't been upped and remains at 800 x 600 pixels (SVGA), which is the one compromise you'll have to make. To this end, you'll find that your laptops images will run at a lower resolution. But the visuals of our test unit were still bright and clear. With a weight of 2kg, this is still a portable product, but the design is a little bulky for regular use. However, the supplied carry case makes it easier to carry out to a car, for example. With a 30dB noise rating, we found this a reasonably quiet machine, which can be further reduced by dropping the machine into eco-mode of 28dB. Any build up of heat is dealt with well, with the vents being situated around the casing. Considering its price, it's hard to fault the EP716R, as it manages to pack plenty of punch and options for the small office or school user.